Simmone Logue has been servicing Sydney's catering industry for 20 years, as well as the hungry patrons perusing the mouthwatering temptations at the Cammeray and Double Bay stores. 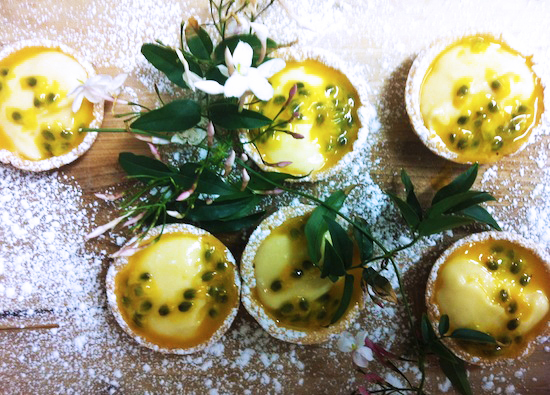 The Gold License caterer has turned 20 this year and to help them celebrate we are sharing the sweet cheer with two delicious recipes: Vanilla Cupcakes; and Crème Patissere Passionfruit Tarts. Melt butter, add sugar and whisk until dissolved. Add milk. In a mixing bowl sift flour, add butter mixture, eggs and vanilla. Whisk until batter is smooth. Do not over beat the mixture. Divide mixture into 12 large patty cases in muffin pan. Bake at 160 degrees for approximately 15 minutes or until a skewer comes out clean. Add milk and vanilla, beat until smooth. Add colouring and mix through. Combine flour, butter and sugar in a food processor. Process until the mix resembles find bread crumbs. Add yolk and chilled water. Process until dough comes together. Turn dough out onto lightly floured surface and kneed until just smooth. Wrap the dough in cling film and refrigerate for 30mins. Preheat the oven to 180 degrees. Roll the dough out, cut and place in small tart moulds/tins. Bake in the oven for 15 mins or until tart cases are golden brown. In a medium size stainless steel bowl, mix the egg yolk and sugar with a wooden spoon. Sift the flour and add to the mixture. Add milk and vanilla bean to the bowl. Mix until thoroughly combined and smooth. Place bowl on stove at a medium heat and bring to the boil stirring constantly. When liquid boils, whisk for 1 minute or until mixture becomes stiff and hard to stir. Pour into a clean bowl and immediately cover with cling film to prevent a skin forming. To serve, spoon crème patissere into tart cases and top with fresh passionate pulp.